Gallant's Automotive has been in business since 1971 and provide a full range of automotive services - we do it all! We are a Maryland State Inspection station. We not only offer general automotive service but specialize in Corvette repairs, restorations and performance enhancement. We specialize in General Motors products. Although our service is focused on individuals, we also perform work for insurance claims including electrical, body, paint and mechanical. We provide pick-up and delivery with our rollback service. Are you new to Maryland and in need of a Maryland State Inspection on your vehicle? Since we are an authorized Maryland State Inspection station. We provide a fast and fair inspection of your vehicle. We can perform any work needed to provide compliance or you can take your car to another station to perform the work. 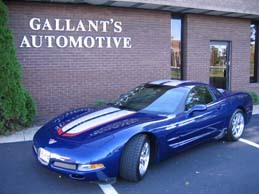 Gallant's Automotive can prepare your car for the track or the road course. We provide custom installation services including installation of roll bars and cages, race prepared interiors, and where it really counts -- in the power train! We not only recondition your suspension but also can design and set up high performance suspension systems. We are experienced with Corvette restorations from C1 to C5 and provide the full range of restorations. We provide restorations to multiple levels ranging from daily drivers, to concours prepared cars and to NCRS originality. We are equally adept at both interiors and exteriors! Do you have a mechanical or electrical problem? If so, see us! We provide a full range of repair services from the infamous "Check Engine" light, to to electrical diagnostics, to all mechanical problems.